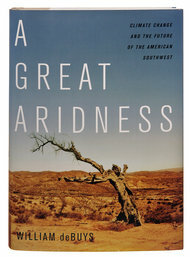 Book Report: “A Great Aridness: Climate Change and the Future of the American Southwest” | "Global Possibilities"
Ari Phillips, who’s pursuing a master’s degree in global policy studies and journalism at the University of Texas, Austin, sent this fine Dot Earth Book Report after reading “A Great Aridness” in preparation for two-month reporting trip this summer exploring energy use and climate change in the Southwest. You can read more about his project here and follow him on Twitter @re_ari. For another look at this book, along with Andrew Ross’s portrait of Phoenix, Ariz., Bird on Fire: Lessons from the World’s Least Sustainable City please read Cornelia Dean’s paired New York Times reviews.